When the Call to Artists went out for Artworks‘ second “Big Pig Gig“, Randy got together with our friend Robin Ewers to submit some designs. 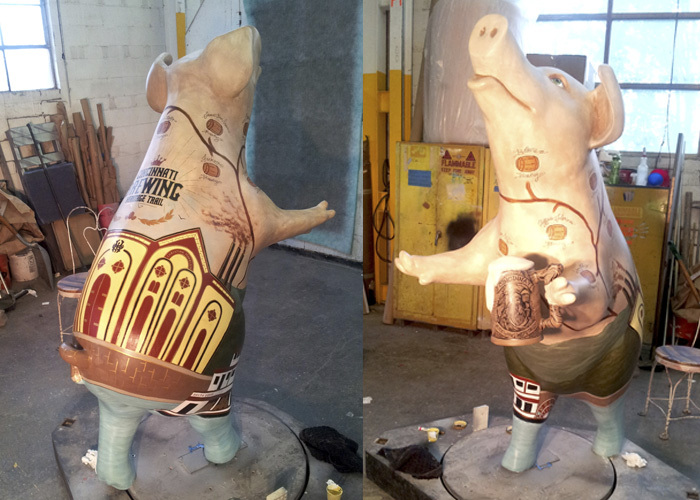 We had seen some of the pigs that were painted three years ago, and were excited to potentially be a part of this great Cincinnati event (which is also a fundraiser for Artworks). We are such a fan of Artworks, as they do incredible work around our area, including the Springboard program of which we were in the inaugural class. And, they are a client–and we had just designed some BPG merchandise. So you can imagine how thrilled we were when we heard one of our designs had been picked. But when we found out who picked it–our new across-the-street neighbors, The Christian Moerlein Brewing Company–we were even more ecstatic. Then we found that they wanted us to tweak the design a bit, to emphasize the Cincinnati Brewing Heritage Trail (part of the Master Plan of the Over-the-Rhine Brewery District Urban Redevelopment Corp.)–we were absolutely overjoyed. The OTR Brewery District is our neighborhood, we are members of the BDURC, and we are passionate about renewing and redeveloping our neighborhood. Truly, it was a “passion project”. 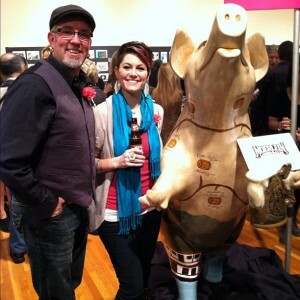 Our pig made his debut at Secret Artworks (where Randy and Robin both had artwork displayed), and then at the Christian Moerlein Brewery Opening Party. Rumor has it that he’ll be back and forth between the brewery and the Christian Moerlein Lager House downtown, so go see him!